Goethe was born almost dead on 28 August 1749. He opened his eyes, he lived, only when the midwife rubbed his heart with wine. Perhaps that uncertain start awoke a determination in him to stay alive as long as possible. There’s a wry saying in German: Alle Menschen müssen sterben — ich auch, vielleicht (All men must die — me too, perhaps). And that’s how Goethe lived, cannily keeping out of the way of death, cramming as much life as he could into the time allowed. Ruthlessly in favour of life, Goethe was the creator, in Werther, of the very type of person who is drawn towards and finally into death. He wrote the novel fast, in four weeks, to be rid of that dangerous possibility or temptation in himself — to be free, as he said, for the further enjoyment of life. Many of his readers didn’t feel so released; in some it fatally encouraged their own inclination to let go. And of course, there was no finality in Goethe’s remedy even for himself. Poets are incapable of “closure”; they hate the very idea of it. Again and again he found himself back in Werther’s predicament, most scandalously in 1821, in love with a seventeen-year-old. In 1824 a fiftieth-anniversary edition of Werther was published, for which Goethe, then seventy-five, supplied a poem addressing the ‘much lamented shade’ in whom he still knew himself. Goethe never did get rid of Werther. Wherever he went, throughout his life, that suicidal character shadowed him. Portrait of Johann Wolfgang von Goethe by Angelica Kauffman, 1787. Goethe-Nationalmuseum. Source: Wikimedia Commons. Like many poets — Yeats, Graves, Apollinaire come to mind — Goethe opposed death mainly by love. It is an old — the old — combat: Eros versus Thanatos, Love versus Death. Goethe was almost always in love. His rebirths, his extraordinary shifts into new poetry, all have a new love at their heart: the Sturm und Drang lyrics, the Roman Elegies, the West-Eastern Divan, the “Trilogy of Passion” — all very different, all written by the same poet, in new circumstances, in a new mode, in love again. Faust, the play he worked at, on and off, for sixty years, the very concept of it shifting as he grew, became, in Part II, a glorious celebration of Eros, the life-giver. Faust is saved, not for any good in him (he is perhaps the least likeable ‘hero’ in world literature), but through the redemptive love of Gretchen, whom he seduced and abandoned. Werther requires that we answer back; that we see what is going to waste in Werther and in Lotte, and that we part company from him when he cannot any longer defend himself and goes his way into death. The injunction of the novel is Goethe’s own continual injunction to himself: resist, fight back, make a life you can call your own. Side with Eros against the many and various ways of Death! David Constantine, born 1944 in Salford, Lancs, was for thirty years a university teacher of German language and literature. He has published several volumes of poetry (most recently Nine Fathom Deep); also a novel, Davies (1985), and three collections of short stories: Back at the Spike (1994), Under the Dam (2005) and The Shieling (2009). He is an editor and translator of Hölderlin, Goethe, Kleist and Brecht. His translation of Goethe’s Faust, Part I was published by Penguin in 2005; Part II in 2009. 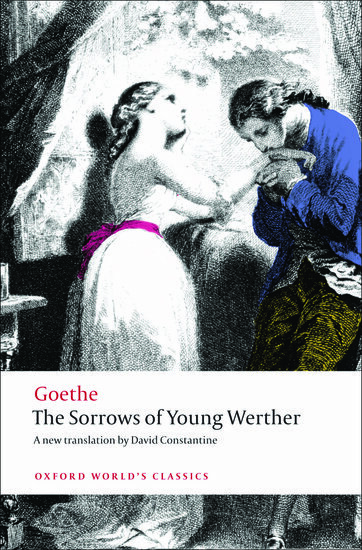 OUP published his translation of the The Sorrows of Young Werther in 2012. He is the winner of 2010 BBC National Short Story Award. Another volume of stories is due out in September. With his wife Helen he edits Modern Poetry in Translation.